Andy Robinson is set to be appointed as Championship club Bristol's new director of rugby. The former England and Scotland coach will be unveiled at a press conference in Clifton on Monday, Press Association Sport reports. 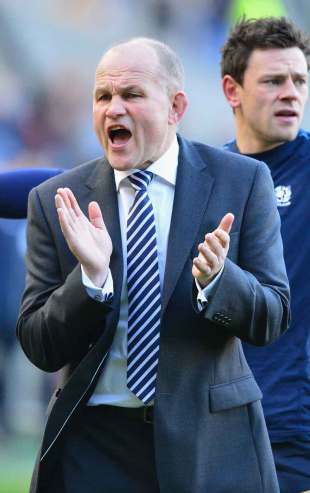 The 48-year-old quit his role with Scotland after a dismal autumn series earlier this season when Robinson's team lost to New Zealand, South Africa and Tonga. Robinson resigned following the 21-15 Tonga defeat in Aberdeen. He had been under contract until the 2015 World Cup. The former Bath boss was appointed Scotland chief in 2009, taking them to the World Cup two years later, but they suffered a pool stage exit for the first time. He headed up the England coaching staff between 2004 and 2006 after succeeding World Cup-winning coach Sir Clive Woodward. Robinson had been part of Woodward's 2003 World Cup coaching staff in Australia, and he also won eight England caps as a player. Bristol are currently battling to secure a place in the Championship play-offs, although Newcastle remain firm favourites to secure the one promotion place available into next season's Aviva Premiership. Robinson is expected to begin work at Bristol before the end of this season, with current head coach Liam Middleton remaining in that role. The west country club have already announced four new signings for next term - Peter Buxton, Mark Sorenson, Andy Short and Errie Claassens - and they could also move to Ashton Gate in a ground-share with Bristol City Football Club. There is the added possibility of a new stadium being built at Ashton Vale in the city, which would be used by Bristol.